Michael Cafferky, DBA MDiv, is the Ruth McKee Chair for Entrepreneurship and Business Ethics at Southern Adventist University where he has been teaching since 2003. He teaches courses in management, business ethics, leadership, organization theory, strategy and the MBA course Integrating Faith and Business. Prior to his work in higher education, Cafferky served for 20 years in the healthcare industry at various levels of leadership including front-line supervisor, department manager, Director of Business Development, CFO, COO and CEO. In 2013 he received the Johnson Award from the Christian Business Faculty Association in national recognition of his efforts toward integrating faith and business in his scholarship. In 2011 he received the annual President Award for Excellence in Scholarship from the faculty of Southern Adventist University. Cafferky earned a Doctor of Business Administration (DBA) degree from Anderson University (IN), the Master of Divinity degree from Andrews University (MI) and a Master of Public Health degree from Loma Linda University (CA). 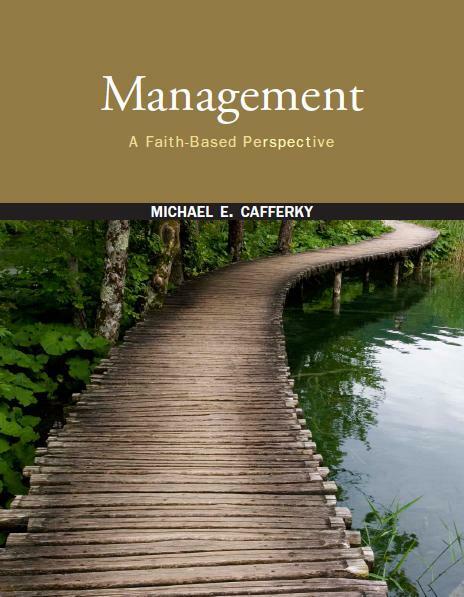 Dr. Cafferky is the author of 8 books and has authored articles published in the Journal of Biblical Integration in Business, Faith in Business Quarterly, Christian Business Academy Review, the Journal of Applied Christian Leadership and the Journal of Religion and Business Ethics. Dr. Cafferky is an active speaker at conferences. He has given presentations on faith and business topics in the United States, Australia, Africa, Russia, Europe, Canada and Mexico. One way to signal to students that you are serious about integrating faith and business in the management classroom is to revise your Syllabus! Think about incorporating a few Bible verses in the Syllabus. Adding a few Bible verses does lengthen the Syllabus somewhat; however, the verses you include there will be a constant reminder to students what your course is all about. Places Scripture in the context of required course elements. It sets the tone for the semester. Signals to students the importance of Scripture in learning about management. Implicitly suggests that Scripture can be foundational for learning about business management. Provides students access to particular verses that you think are important when considering management practice. Provides point of conversation right at the first of the semester when you go over the required course elements. Here is a sample list of Bible verses to consider choosing from to put in your course Syllabus. These are some of my favourites. You will think of others. This list demonstrates to students that management wisdom and guidance come from both the Old Testament and the New Testament. The following verses are from the New American Standard version. 1 Corinthians 12:4-11 Now there are varieties of gifts, but the same Spirit. 5 And there are varieties of ministries, and the same Lord. 6 And there are varieties of effects, but the same God who works all things in all persons. 7 But to each one is given the manifestation of the Spirit for the common good. 8 For to one is given the word of wisdom through the Spirit, and to another the word of knowledge according to the same Spirit; 9 to another faith by the same Spirit, and to another gifts of healing by the one Spirit, 10 and to another the effecting of miracles, and to another prophecy, and to another the distinguishing of spirits, to another various kinds of tongues, and to another the interpretation of tongues. 11 But one and the same Spirit works all these things, distributing to each one individually just as He wills.